SFWD receives first installment check to cover costs associated with construction and maintenance of new water treatment facility at Plant No. 3. Thanks in part to U.S. 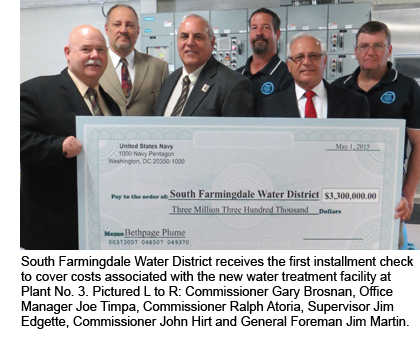 Senator Charles E. Schumer’s unwavering support during final settlement negotiations with the U.S. Navy, South Farmingdale Water District (SFWD) was presented with a check for $3.3 million as the first installment for covering all costs associated with the construction, ongoing maintenance and operation of the water treatment facility at Plant No. 3 (Hicksville Road). This first installment is a huge first step as SFWD had borrowed almost $5 million from the Town of Oyster Bay to construct a new water treatment facility at Plant No. 3 to filter and purify the groundwater from the impending plume. Since repaying the bond would have cost consumers approximately $1.5 million each year over the course of the loan, Schumer called upon the U.S. Navy and Department of Justice (D.O.J.) to prevent significant water bill increases for all District taxpayers. This announcement and settlement means that local ratepayers will not be financially responsible for the new water treatment facility at Plant No. 3. The second installment of funds will be made shortly. SFWD has submitted the appropriate paperwork, which needs to be reviewed and approved by the U.S. Navy. “South Farmingdale Water District ratepayers didn’t cause this toxic mess, and this $3.3 million in reimbursement from the U.S. Navy means they won’t have to pay to clean it up,” said Schumer. SFWD Commissioners commented that this is a major relief for District consumers. The Commissioners also emphasized that all water pumped from all wells meets or exceeds all local, state and federal standards. SFWD had no choice but to design, construct and build the water treatment facility at Plant No. 3 in advance of the plume’s impact.